Chanteur Anglais né Reginald Leonard Smith, le 15 Avril 1939 Blackheath, London. Marty Wilde a débuté en 1958 et il fut surtout le spécialiste de la "Cover". En fait, il nous laisse qu'un titre original de sa composition, l'inquiétant "Bad Boy" (59) qui fut pour Marty un très grand succès. Il est le père de la chanteuse Kim Wilde. England in the late 1950s had its share of rock & roll stars - Cliff Richard was the most successful and was still at it in 2004, some 46 years later, with a knighthood to show for it on top of everything else; and the late Billy Fury is still revered by those aware of the music. In between them, chronologically, stands Marty Wilde. Born Reginald Leonard Smith in Blackheath on April 15, 1939, he grew up in Greenwich, in southeast London. The son of a professional soldier, he lived in various parts of England throughout his childhood. He reached the middle of his teen years living in London, just at the point that Lonnie Donegan, playing in a jazz band run by Chris Barber, had jump-started the entire skiffle boom with "Rock Island Line" which, in turn, fostered the beginnings of a rock & roll boom in England — an aspiring singer, Smith was a natural prospect as he was already proficient on the ukulele and simply switched to guitar. By 1957, in the wake of Tommy Steele's sudden rise to stardom, London was filling up with would-be rock & rollers, including the 17-year-old Smith, who was performing at the Condor Club in Soho one night — for a pound a night plus a meal — where he was spotted by Larry Parnes. Parnes was the most successful manager on London's newly spawned rock & roll scene, and, among other attributes, was known for choosing highly expressive stage names for his artists, intended to insinuate themselves on the audience's memory — he had already scored with Tommy Steele (aka Tommy Hicks), Vince Eager, and Duffy Power, among others. 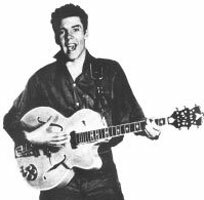 Reg Smith was signed up, renamed Marty Wilde, and proved so popular on the subsequent package tour where he was booked, that it was no problem getting him on to television, and then signed to Philips Records. His first single, "Honeycomb," failed to chart, and it wasn't until "Endless Sleep" in the summer of 1958 that he saw any success. That record reached the U.K. Top Five in 1958, around the time that Cliff Richard was cutting his first single. Wilde became a fixture on England's early rock & roll television showcases, most notably Oh Boy! and Boy Meets Girl, and he later did a Royal Variety Performance. He was a major rival to Cliff Richard for more than a year, from mid-1958 until the opening months of 1960. Both were powerful singers, but Wilde had a different kind of voice and presence, with a dark, brooding quality that came out in his rock & roll ballads — one couldn't imagine Marty Wilde doing Cliff Richard's light pop ballad "Living Doll," but it was easy to visualize him doing Gene Vincent's "Be-Bop-A-Lula" or, even more so, "Woman Love." He went hitless for the rest of 1958, but the following year, he charted four consecutive hit singles: A cover of Ritchie Valens' "Donna"; a rendition of "A Teenager in Love" that eclipsed Dion's original; and "Sea of Love," each of which made it to Number Three on the charts. He closed the year with what proved to be his defining hit, "Bad Boy," which he also wrote — a dark, threatening ballad, it oozed menace and mystery by the standards of its day, and it became Wilde's biggest single, even reaching the lower level of the charts in America, where it was released by Epic Records (which had a licensing deal with Philips) as a single and on an LP. Musically, he had enough credibility so that his band, the Wild Cats, was called on to back Eddie Cochran and Gene Vincent when they toured England, and he ended up appearing jointly with the two American rock & roll legends. The Wild Cats were a story unto themselves — recruited in 1958, their original lineup consisted of Big Jim Sullivan on lead guitar, Tex Makins on bass, Tony Belcher playing rhythm guitar, Alan LeClair at the piano, and Bobby Woodman on drums; they were noted for their wild, over-the-top stage act, and this worked for a few months before the lineup shifted. Finally, with Sullivan and Belcher remaining, Brian "Licorice" Locking was brought in on bass, and Brian Bennett on the drums, and that quartet became the most famous version of the Wild Cats, and the lineup that backed Vincent and Cochran. Wilde was still at the top of his game when, while appearing at Birkenhead in 1959, he was approached by a Liverpool singer-guitarist-songwriter named Ronald Wycherley, who was trying to get some original songs to Wilde and Parnes for their consideration. Parnes was impressed with the songs and the playing, but also the good looks of the young man and his honest, easy charm; soon after Wycherley turned into Billy Fury, who would ride the British charts for four years. And late that year, Wilde married Joyce Barker, a member of the singing group the Vernons Girls — they had their first child, Kim, a year later. He released two LPs, Wilde About Marty and Showcase, in 1959 and 1960, respectively. By the end of 1960, however, the moment had passed to Fury, even as Wilde continued to command the public's attention. He was never able to replicate the success of "Bad Boy," though he did reach the Top Ten once more, in 1961, with the highly animated pop/rock novelty tune "Rubber Ball," and had a Number 20 hit in 1962 with the pop standard "Jezebel." He also maintained a top-flight band, whose members included a young guitarist named Justin Hayward, later of the Moody Blues, who credited Wilde with teaching him a great deal about music that served him well in decades to come. Wilde was enough of a star to perform in the London production of Bye Bye Birdie, but by 1963, when the Liverpool sound came along, he was effectively regarded as part of music's past. His subsequent recordings were all-but-invisible, although he enjoyed continued success in an offshoot field, as a composer: "Ice in the Sun" by Status Quo, "Jesamine" by the Casuals, and Lulu's recording of "I'm a Tiger" were three of his more notable hits as a songwriter. Curiously, Wilde did chart once more in America, with the single "Abergavenny," which he recorded under the pseudonym Shannon, which was released stateside by the Heritage label. And long after his own era on the charts had passed, "Bad Boy" was covered by such diverse contemporary talents as Robert Gordon and Nirvana. In the early 1980s, Wilde's daughter Kim Wilde emerged as a star Vocalsist in the burgeoning new wave field, and has enjoyed two decades of success. Meanwhile, Wilde himself never entirely gave up performing, and in the 1990s enjoyed a fresh wave of interest in his music in England, as audiences began to take stock of their surviving music heroes. In 2003 and 2004, in his mid-60s and backed by the current lineup of the Wild Cats, he was maintaining a full performing schedule for half the year, more than 40 years after his last charting single.